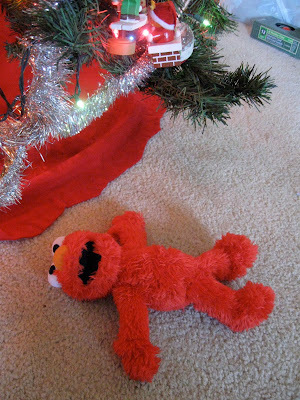 Holidays are officially over for us, and I should feel wiped out, sort of like the Elmo doll above that was left behind by one of our little granddaughters. Perhaps it is all the sugar we are still eating, but instead I feel exhilarated, Christmasy even. Walter braved the cold this morning, riding his bicycle to work before 6 a.m. in 22-degree weather. Brrrrrr! When he returned home from delivering his first three busloads of children to their respective schools, we headed for Coffee Fusion, a coffee shop just a few blocks from where we live. Walter and I enjoy our conversations there, undistracted by tasks undone. Since retiring, I relax and rarely watch the clock. Either one of us is likely to utter – with great enthusiasm -- what has become our mantra since I retired: “It’s like a vacation day!” After about 30 minutes to an hour of talk, laughter and taking (and usually failing) the Coffee News trivia test, we turn on our computers and away we go via the Internet. I left behind a home that has sleeping bags and toys still to be tucked away and Christmas decorations still out in all their glory. Oh well, as long as I get them put away before the kids come again. After all – It’s like a vacation day! Isn't it wonderful not to worry if everything gets done right away! I love retirement and not having to be on a schedule.